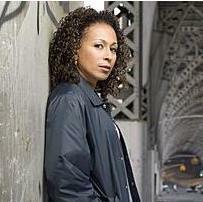 Tamara Tunie stars as medical examiner Melinda Warner on "Law and Order: Special Victims Unit." Photo courtesy of NBC. Social workers do not get the credit they deserve for protecting abused and neglected children, an actress who stars on NBC’s “Law and Order: Special Victims Unit” and was a regular on the soap opera “As the World Turns” says. Tunie is celebrity spokeswoman for the National Coalition to End Child Abuse Deaths. NASW is a member of that coalition, along with the National Center for Child Death Review, the National Children’s Alliance, the Every Child Matters Education Fund and the National District Attorneys Association. Child abuse is a serious problem that may be even larger because it is underreported, coalition members said. Child abuse death rates in the United States are triple that of Canada and 11 times greater than Italy. Seven children die each day in the United States from abuse and neglect. The participants in a 2009 Summit on Child Abuse and Neglect Deaths among other things called on a national strategy to combat the problem and additional funding so child protective workers and other frontline workers have smaller caseloads. Clark said at the congressional briefing that professionals who protect children also need increased training and there should be more public education programs about “secret” social problems such as child abuse and neglect. 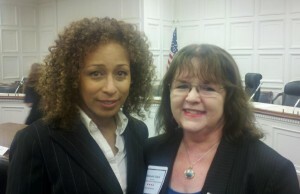 Actress Tamara Tunie and NASW Executive Director Betsy Clark greet after the Congressional briefing. Tunie said members of the coalition approached “Law and Order: Special Crime Victims Unit” about getting celebrity support for their campaign and she agreed to become spokeswoman. Tunie, who portrays medical examiner Dr. Melinda Warner on “Law and Order,” said social workers are sometimes blamed in the media for not protecting children. However, the actress said she realized the media was reporting isolated incidences and not covering the thousands of positive stories about social workers keeping children out of harm’s way. Tunie commends social workers and other professionals who protect children, saying she does not know how they could keep composed and professional while handling sometimes horrific cases of child abuse and neglect. UPDATE: Tamara Tunie returned to Congress on July 12, 2011 to speak on the behalf of the National Coalition to End Child Abuse Deaths. To watch that House Ways and Means Human Resources subcommittee hearing on C-SPAN click here. You can also read hearing testimony on the House Ways and Means Committee Website by clicking here. To learn more about how social workers help children, visit NASW’s “Help Starts Here” Kids & Families Website by clicking here. Thank you for highlighting this (my) wonderful and most noble profession of social work. Thank you for your comments. Your show is one I try not to miss. It is nice to know the work of many social workers will get the recognition it deserves. Yes, we want to take them home with us, but know we can not. We must do what we can at the time, then let go, hoping the “ripple effect” of our work will continue through the lives of those we touch.